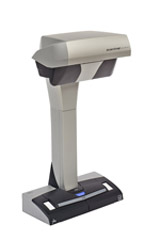 Fujitsu ScanSnap SV600 The ScanSnap SV600 makes overhead scanning simple, providing users with limitless possibilities. Scans bound material and flat documents. Scans an A3 size area in less than 3 seconds. CCD optic with fast LED illumination. Erase finger from image function. Auto crop, de-skew and rotation features. Searchable PDF, PDF and JPEG creation. Single scan multiple document cropping function. Enhance productivity with Fujitsu Service and support. Automatically recognizes document size, A3 (landscape), A4 (landscape), A5 (landscape) A6 (landscape), B4 (landscape), B5 (landscape), B6 (landscape), Post Card, Business Card, Double Letter (landscape), Letter, Legal (landscape) and Customized size (Max: 432 x 300 mm (17.0 x 11.8 in. ), Min: 25.4 x 25.4mm (1 x 1 in. ).